After such a long time it seems only polite to make a post in here to say hello once more! The forum told me my password was over 565 days old which has certainly made me feel a great deal older than when I last visited here. The last few years have been a rollercoaster but with things settling down I'd like to try to be a little more active again, especially in the coding sections since web development has ended up being my career, due in no small part to the extreme good fortune of meeting Logan.ps way back when. So, to the old faces, it's great to see the place is still alive and kicking, and to the many new ones another hello . Hello there, Jamesy! Welcome back! I am very well . All grown up now, even have the council tax bill to prove it (woo... haha). I'm living with my girlfriend up in Lincoln which I moved to last year just before I graduated from the uni here, in fact most of the last 12 months or so has been moving on from being a student - luckily I had a job to go straight into which I'm still doing, developing for a neat little studio in the city. Rather worryingly I can even drive a car now - a dangerous idea indeed. 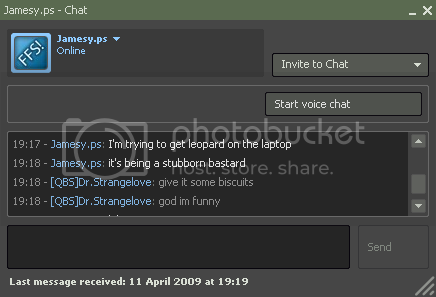 Oh my, I am struggling to remember how the reply system works let alone work on vBulletin. It was actually Logan connecting on Linkedin that reminded me I should really check back here! Amazed at how long it's been! Great to hear from you again!